Ben Okafor is a unique musician who makes roots reggae music and bridges an artistic gap between Jamaican reggae, Afro-pop and UK folk. He has shared a stage with popular music giants like Cliff Richard, Van Morrison and Billy Bragg and has been touring and making new music since 1985. Perhaps the most pertinent thing about Ben’s music is his political focus and drive for social change. He was born in Enugu in eastern Nigeria with 7 siblings and his early life was defined by the Biafran civil war which erupted when he was 12. He enlisted in the Biafran military intelligence arm known as ‘the Boys Company’ without telling his parents, but luckily missed his mission rendezvous which failed with horrendous consequences. Nevertheless Ben witnessed the fighting, terror and violence first hand and has experienced being in the line of fire. This fraught background coloured some of his musical experiences in writing and in performance. Indeed, his music has such power in his native Nigeria that he has even been threatened not to play “Raise your Conscience” by a Nigerian military general and has had tanks at one of his gigs in Apartheid South Africa. His music carries messages relating to these experiences and each one tells a fascinating story. It is for this reason that his music has received praise from the likes of Chris Rea, Bono and BBC Radio 2 DJ Simon Mayo and he has played at Glastonbury Festival, the Cambridge Folk Festival and the World Music Festival in Copenhagen. Due to his political background Ben has also had the privilege to play at high profile events to influential world leaders such as Archbishop Rowan Williams and Gordon Brown at the Lambeth Conference in 2008, at the ‘Make Poverty History’ Gleneagles Summit and at a Commonwealth leader’s summit with HM the Queen and Prince Philip. He is therefore used to gaining a great deal of attention through his music, he sees his art and art in general as a way of influencing people to do good in the world. He currently runs a charity called ‘Amaka Beautiful Child’ (ABC) which is itself committed to ‘social and personal transformation through the arts’. It aims to use poetry, music, art, drama and dance (all interests of Ben’s) for the sake of social cohesion in order to bring communities together. Ben has been busy working on a number of projects such as the empowerment of young refugees, a campaign to make primary education free for all children globally (UN development goal for 2015), and the creation of a physical space for sociological artistic expression in his home town of Great Malvern. Ben’s range of life experiences has provided him with some rich insight into the world around him. 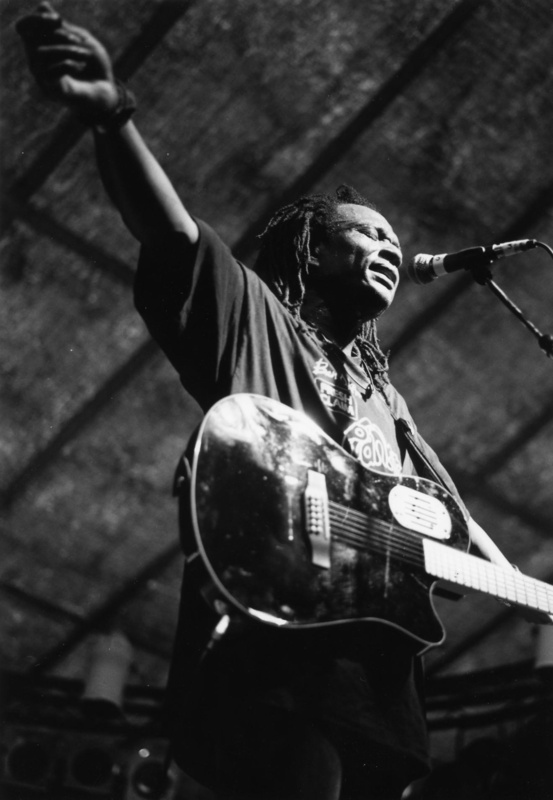 His albums like ‘Thing with War’ (2003) and ‘Child of Biafra’ (2007) investigate some of the effects of war and express Ben’s own experiences of conflict and violence. Whereas some of his other records such as ‘Nkiru’ (1989) and his most recent album, ‘Diverted Traffic’ (2009) delve more broadly into the human condition, self-identity, and the potential conflicts between artistic expression and a market centred music industry. In early 2010, Ben’s youngest child was born which naturally took priority and caused him to take some time out from the industry. This didn’t stop him from continuing to write new music that will be recorded later this year for his new album. Overall, there is no doubt that Ben Okafor is a fascinating musical talent with a rich personal history. Together these two facets of talent and wisdom make for quite a special listen.